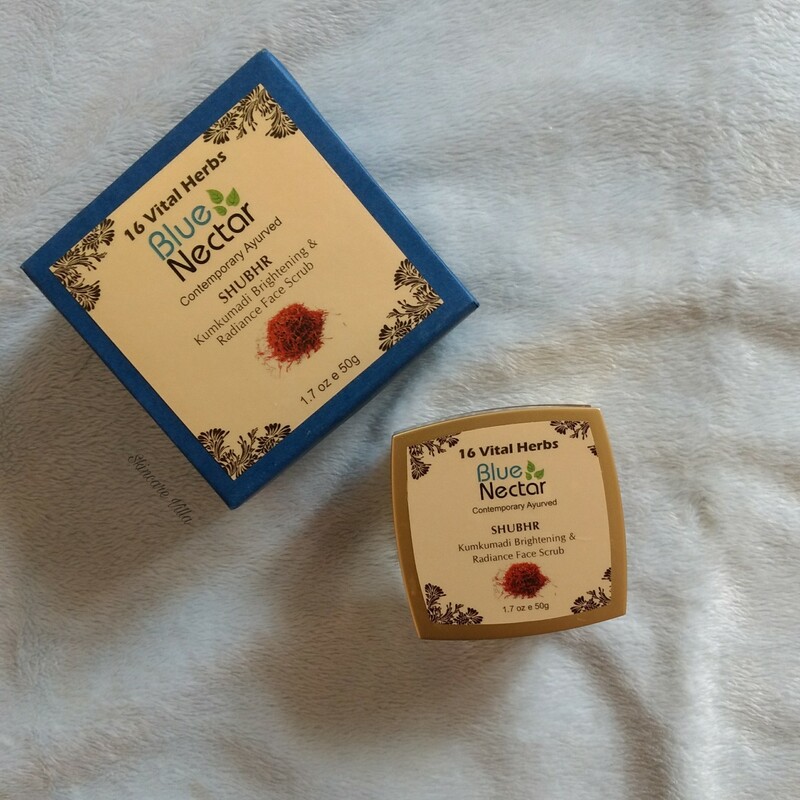 Today I will be reviewing another product from Blue Nectar which I had received last month. 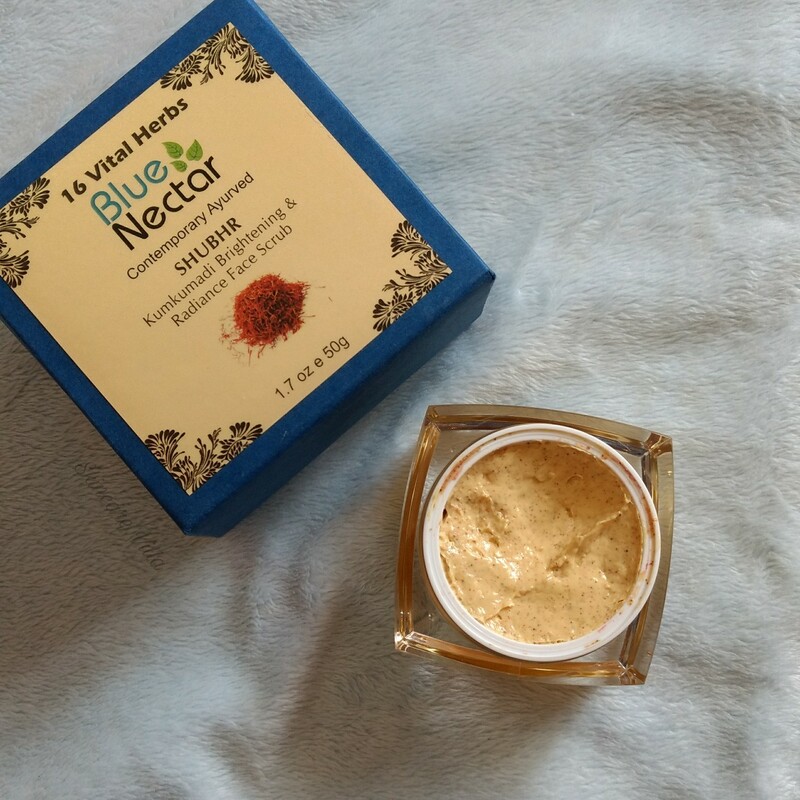 I have already reviewed the Blue Nectar Shubhr Ayurvedic Sandalwood Brightening and Radiance Cream. Let's head straight to the review without wasting much time. 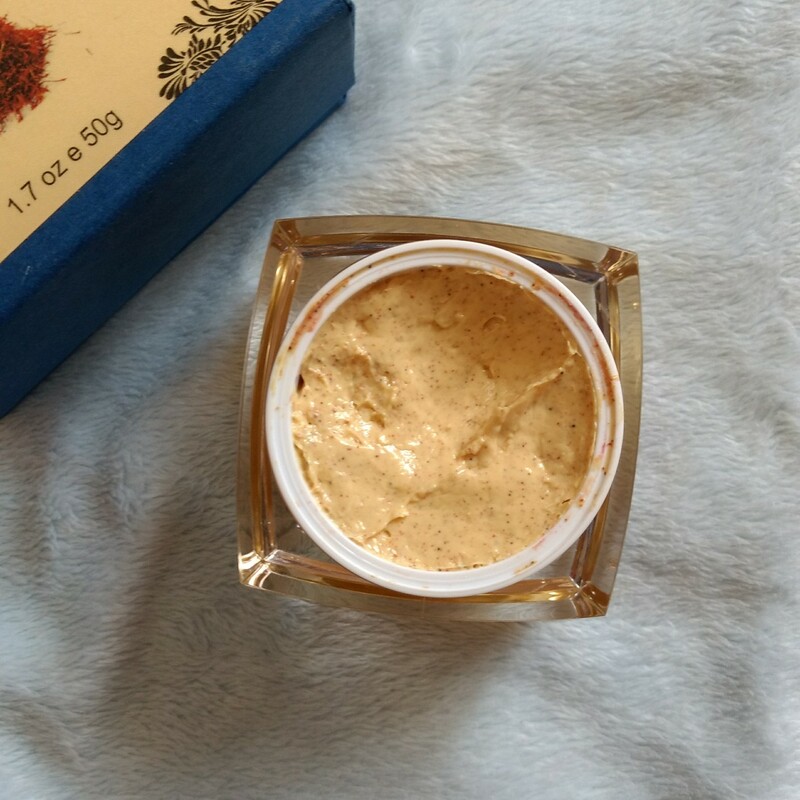 The product has a luxurious packaging similar to the Sandalwood Cream which I have reviewed earlier. So I would go for into it, but would just like to mention that even though the jar looks heavy it is light weight. Coming the fragrance and texture, it has a royal sandalwood fragrance and a creamy texture. The consistency is a but fluffy and colour of the product is yellow with minute scrub particles. The product at a glance looks like a dessert made up of Almonds. Each time I try the product, I somehow conrl my temptation to eat it. The product initially feels a little creamy while applying as a scrub. But as and when you keep on scrubbing the creamy base melts into your skin (like a cleansing balm 💕) making it smooth and soft, while the scrub granules scrub off the skin. I didn't find any tingling sensation around my sensitive nose area while using this scrub. I did remove the dead skin cells from my face but it didn't have any effect on the white heads. Also I never expect any scrub to work upon my black heads. So I didn't expect this scrub to do the black head removal. Once the scrub melts into the skin, it leaves behind an even toned, soft and supple skin. When I use this scrub at night time I skip my moisturiser, while during day time I use a light moisturiser post using this. The scrub particles are appropriate in size, not too small and not too big. Also I prefer my face scrub to be mild enough like this. According to the claims to the product, it does give an instant glowing skin with each usage. However the working on fine lines, dark circles part I cannot confirm since I don't suffer from fine lines and I haven't tried the scrub near my eye area. However I have seen very small improvement in pigmentation with 8-9 uses of the scrub. Regular usage may result in decreased pigmentation and results may vary from person to person. Since I am not a person who would expect a scrub to work on pigmentation as well as do the scrubbing part, I find the price point high. I would like my scrub to just remove the dead skin cells. 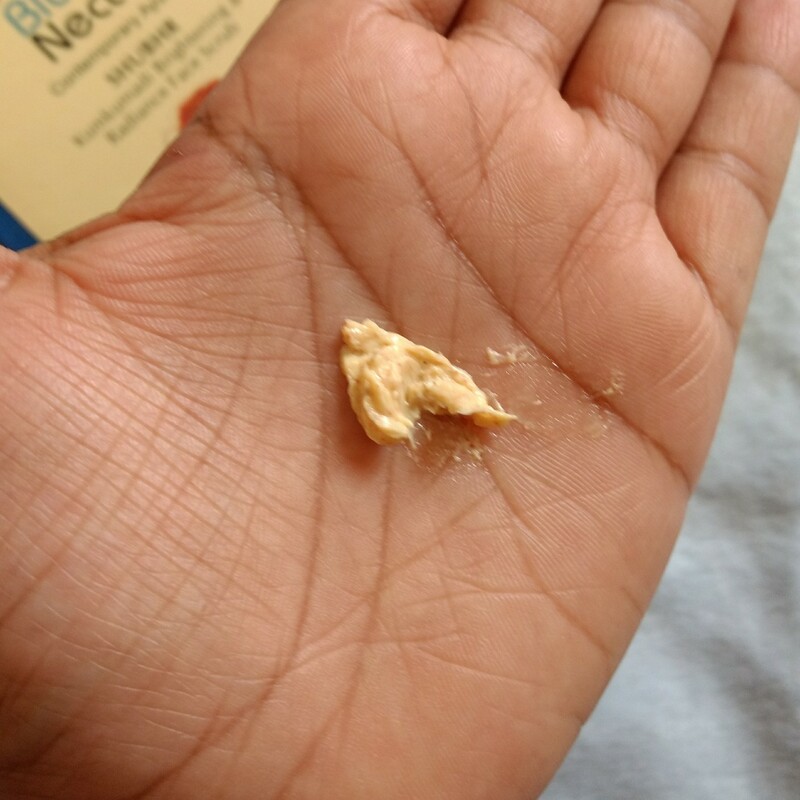 However a Kumkumadi Tailam enriched scrub does sound good, keeping in mind the results with prolonged usage of 2-3 months. 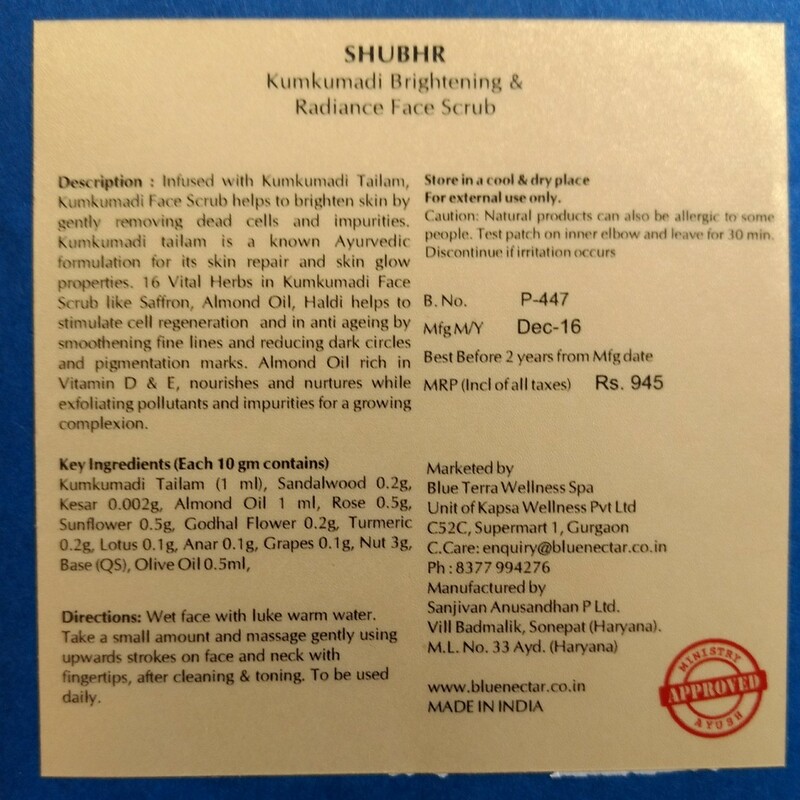 The Blue Nectar Kumkumadi Brightening and Radiance Face Scrub can be tagged as a luxurious skincare product which lives upto the expectations of a good scrub. However addition of some ingredients like Saffron, Kumkumadi oil can be attributed to the high price point of the scrub. Regular and prolonged use of the product will definitely be beneficial to the skin but, I would love buying the product on a discount and would categorize it as a luxurious skincare product. So if you are a luxurious skincare freak you should try this one. Also if the brand could make a similar scrub at an affordable price it would be an icing on the cake 😊.